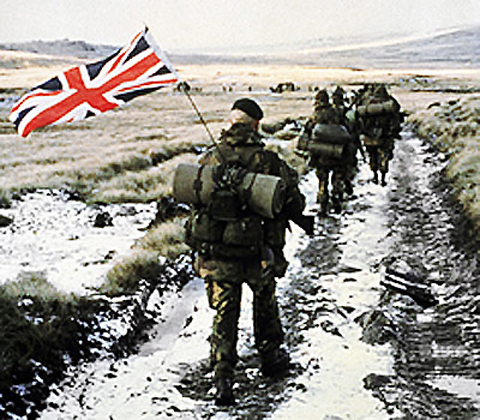 The Battle of Goose Green (28–29 May 1982) was an engagement between British and Argentine forces during the Falklands War. Goose Green and its neighbouring settlement Darwin on East Falkland lie on Choiseul Sound on the east side of the island’s central isthmus. They are about 13 miles (21 km) south of the site where the major British amphibious landings took place in San Carlos Water (Operation Sutton) on the night of 21/22 May 1982. 98 army wounded and at least 14 air force personnel wounded. Vegetation and terrain: Low tussock covered hills with gorse filled valleys. Image is looking south in the direction of A Company, 2 Para attack with Darwin settlement on the left. Darwin Hill on the right. Goose Green and Darwin are on a narrow isthmus connecting Lafonia to Wickham Heights, which together form the large eastern island of the Falkland Islands. The terrain is rolling and treeless and is covered with grass outcrops, areas of thick gorse and peat bogs making effective camouflage and concealment extremely difficult. From May to August, the southern hemisphere winter, the ground is sodden and frequently covered with brackish water, causing movement to be slow and exhausting, especially at night. The isthmus has two settlements, both on the eastern coastal edge with Darwin settlement to the north and Goose Green to the south. The islands have a cold, damp climate and light, drizzly rains occur two out of every three days with continuous winds. Periods of rain, snow, fog, and sun change rapidly, and sunshine is extremely limited, leaving few opportunities for troops to warm up and dry out. The bulk of the Argentine forces were in positions around Port Stanley about 50 miles (80 km) to the east of San Carlos. The Argentine positions at Goose Green and Darwin were well defended by a force of combined units equipped with artillery, mortars, 35 mm cannon and machine guns. British intelligence indicated that the Argentine force only presented limited offensive capabilities and did not pose a major threat to the landing area at San Carlos. Consequently, Goose Green seemed to have no strategic military value for the British in their campaign to recapture the islands and initial plans for land operations had called for Goose Green to be isolated and bypassed. The defending Argentine forces, known as Task Force Mercedes, consisted of two companies of Lieutenant-Colonel Italo Piaggi‘s 12th Infantry Regiment (IR12)—his third company (Company B) was still deployed on Mount Kent as Combat Team Solari and was only to re-join the battalion after the first days fighting. The Task Force in 1982 also contained a company of the Ranger-type 25th Infantry Regiment (IR25). Air defence was provided by a battery of six 20 mm Rheinmetall manned by Air Force personnel and two radar-guided Oerlikon 35 mm anti-aircraft guns from the 601st Anti-Aircraft Battalion, that would be employed in a ground support role in the last stages of the fighting. There was also one battery of three OTO Melara Mod 56 105 mm pack howitzers from the 4th Airborne Artillery Regiment. Pucarás based at Stanley, armed with rockets and napalm, provided close air support. Total forces under Piaggi’s commanded numbered 1083 men. Piaggi’s orders required him: (a) to provide a reserve battle group (Task Force Mercedes) in support of other forces deployed to the west of Stanley; (b) to occupy and defend the Darwin isthmus; and (c) to defend Military Air Base Condor located at Goose Green. He assumed an all-round defence posture with Company A, IR12 providing the key to his defence, they being deployed along a gorse hedge running across the Darwin isthmus from Darwin Hill to Boca House. Piaggi deployed his Recce Platoon as an advance screen forward of Company A IR12 towards Coronation Ridge while Company C IR12 were deployed south of Goose Green to cover the approaches from Lafonia. To replace his Company B left on Mount Kent, he created a composite company from headquarters and other staff and deployed them in Goose Green. 1st Lt Carlos Daniel Esteban‘s “Ranger” Company C IR25 provided a mobile reserve and were billeted at the school-house in Goose Green. Elements were also deployed to Darwin settlement, Salinas Beach and Boca House and the air force security cadets together with the anti-aircraft elements were charged with protecting the airfield. Minefields had been laid in areas deemed tactically important (Refer Map 2) to provide further defence against attack. The conscripts of 25th Infantry wanted to fight and cover themselves in glory. The conscripts of 12th Infantry Regiment fought because they were told to do so. This did not make them any less brave. On the whole, they remained admirably calm. On 4 May three Royal Navy Sea Harriers operating from HMS Hermes attacked the airfield and installations at Goose Green. During the operation, a Sea Harrier was shot down by Argentine 35mm anti-aircraft fire, killing its pilot. As part of the diversionary raids to cover the British landings in the San Carlos area on 21 May, which involved naval shelling and air attacks, ‘D’ Squadron of the SAS put in a major raid to simulate a battalion-sized attack on the Argentine troops dug in on Darwin Ridge. Argentine forces had also spotted 2 Para reconnaissance parties in the days prior to the attack. Throughout 27 May, Royal Air Force Harriers were active over Goose Green. One of them, responding to a call for help from 2 Para, was lost to 35mm fire while attacking Darwin Ridge. The Harrier attacks, the sighting of the reconnaissance elements as well as the BBC announcing that the 2nd Battalion of the Parachute Regiment were poised and ready to assault Darwin and Goose Green the day before the assault alerted the Argentine garrison to the impending attack. Thompson ordered 2nd Battalion of the Parachute Regiment (2 Para) to prepare for and execute the operation as they were the unit closest to Goose Green in the San Carlos defensive perimeter. He ordered Lieutenant-Colonel Herbert ‘H’ Jones, Officer Commanding 2 Para, to “carry out a raid on Goose Green isthmus and capture the settlements before withdrawing in a reserve for the main thrust to the north.” The “capture” component appealed more to Jones than the “raid” component, although Thompson later acknowledged that he had assigned insufficient forces to rapidly execute the “capture” part of the orders. 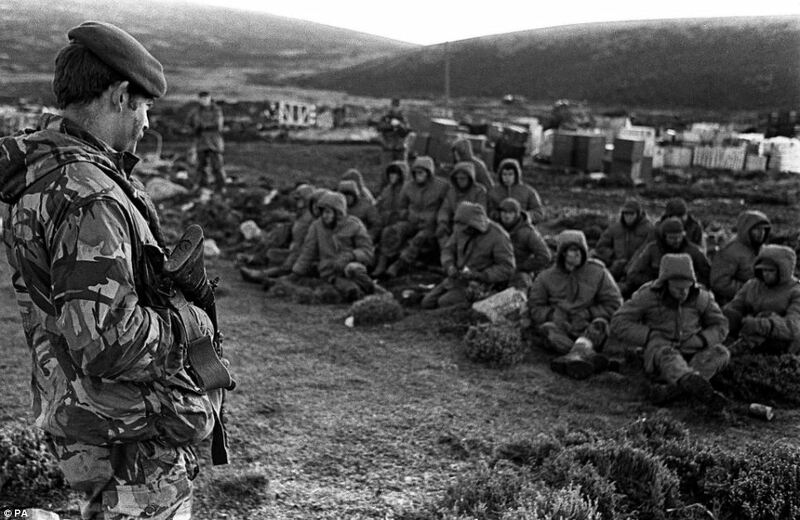 2 Para consisted of three rifle companies, one patrol company, one support company and an HQ company. Thompson had assigned three 105 mm artillery pieces with 960 shells from 29 Commando Regiment, Royal Artillery; one MILAN anti-tank missile platoon and Scout helicopters as support elements. In addition, close air support was available from three Royal Air Force Harriers, and naval gunfire support was to be provided by HMS Arrow in the hours of darkness. SAS reconnaissance had reported that the Darwin – Goose Green area was occupied by one Argentine company. Brigade intelligence reported that enemy forces consisted of three infantry companies (two from IR12 and one from IR25), one platoon from IR8 plus a possible amphibious platoon together with artillery and helicopter support. Jones was not too perturbed by the conflicting intelligence reports and, incorrectly, tended to believe the SAS reports, on the assumption that they were actually “on the spot” and were able to provide more accurate information than the Brigade intelligence staff. Based on this intelligence and the orders from Thompson, Jones planned the operation to be conducted in six phases, as a complicated night / day, silent / noisy attack. C Company was to secure the start line and then A Company was to launch the attack from the start line on the left (Darwin) side of the isthmus. B Company would launch their attack from the start line directly after A Company had initiated contact and would advance on the right (Boca House) side of the isthmus. Once A and B Companies had secured their initial objectives, D Company would then advance from the start line between A and B Companies and were to “go firm” on having exploited their objective. This would be followed by C Company, who were required to pass through D Company and neutralise any Argentine reserves. C Company would then advance again and clear the Goose Green airfield after which the settlements of Darwin and Goose Green would be secured by A and D Companies respectively. As most of the helicopter airlift capability had been lost with the sinking of the Atlantic Conveyor, 2 Para were required to walk the 13 miles (21 km) from San Carlos to the forming-up place at Camilla Creek House. C Company and the commando engineers moved out from there at 22:00 on 27 May to clear the route to the start line for the other companies. A fire base (consisting of air and naval fire controllers, mortars and snipers) was established by Support Company west of Camilla Creek, and they were in position by 02:00 on the morning of 28 May. The three guns from 8 Battery, their crew and ammunition had been flown in to Camilla Creek House by 20 Sea King helicopter sorties after last light on the evening of 27 May. The attack, to be initiated by A company, was scheduled to start at 03:00, but because of delays in registering the support fire from HMS Arrow, only commenced at 03:35. At 03:35 HMS Arrow opened fire (she was to fire a total of 22 star-shell (illumination) and 135 rounds of 4.5″ HE shells in a 90-minute bombardment), signalling the start of the attack. In the ensuing night battle about twelve Argentines were killed. The platoon under Sub-Lieutenant Gustavo Adolfo Malacalza fought a delaying action against the British paratroopers, blooding themselves on Burntside Hill before taking up combat positions again on Darwin Ridge. Major Philip Neame’s D Company was temporarily halted by the Coronation Ridge position. Two of his men, 24-year-old Lance-Corporal Gary Bingley and 19-year-old Private Barry Grayling darted out from under cover to charge the enemy machine gun nest that was holding up the advance. Both were hit 10 metres (11 yd) from the machine gun, but shot two of the crew before collapsing. Bingley “got hit in the head and I got hit in the hip,” Grayling recalled in an interview published in 2007. “Unfortunately, he didn’t make it.” Bingley was posthumously awarded the Military Medal and Grayling was decorated with the Queen’s Gallantry Medal. With the enemy machine gun out of action, the Paras were able to clear the Argentine platoon position, at the cost of three dead. Then 2 Para moved on to the south via Darwin Parks. The Argentines made a determined stand along Darwin Ridge. As A and B Companies moved south from Coronation Ridge they were raked by fire from a couple of concealed Argentine FN MAG machine guns. An Argentine senior NCO, Company Sergeant-Major Juan Carlos Cohelo, is credited with rallying the IR12’s A Company remnants falling back from Darwin Parks, and was later awarded the Medal of Valour in Combat. He was seriously wounded later in the day. Another two IR12 NCOs, reported to be sergeants, who had fallen back from the earlier fighting, at great risk to themselves cleared the jammed machinegun of IR25 Private Jorge Oscar Ledesma, allowing him to resume fire at a critical point in the morning battle; Ledesma’s fire killed Colonel Jones, according to 2012 Argentine reports. At this juncture of the battle, 2nd Para’s advance had become stuck. A Company was in the gorse line at the bottom of Darwin Hill, and against the entrenched Argentines who were looking down the hill at them. As it was now daylight, Jones led an unsuccessful charge up a small gully resulting in the death of the adjutant, Captain Wood, A Company’s second-in-command Captain Dent, and Corporal Hardman. By then it was 10.30 am and Major Dair Farrar-Hockley‘s A Company made a third attempt, but this petered out. Eventually the British company, hampered by the morning fog as they advanced up the slope of Darwin Ridge, were driven back to the gulley by the fire of 1st Platoon of IR25’s C Company, under the command of 2nd Lieutenant Roberto Estévez. It was almost noon before the British advance resumed. A Company soon cleared the eastern end of the Argentine position and opened the way forward. There had been two battles going on in the Darwin hillocks – one around Darwin Hill looking down on Darwin Bay, and an equally fierce one in front of Boca Hill, also known as Boca House Ruins. Sub-Lieutenant Guillermo Ricardo Aliaga‘s 3rd Platoon of RI 8’s C Company held Boca Hill. The position of Boca Hill was taken after heavy fighting by Major John Crosland’s B Company with support from the MILAN anti-tank platoon. Sub-Lieutenants Aliaga and Peluffo were gravely wounded in the fighting. Crosland was the most experienced British officer and, as the events of the day unfolded, it was later said that Crosland’s cool and calm leadership of his soldiers on the battlefield turned the Boca House section of the front line. About the time of the victory at the Boca Hill position, A Company overcame the Argentine defenders on Darwin Hill, finally taking the position that had resisted for nearly six hours,[f] with many Argentine and British casualties. Majors Farrar-Hockley and Crosland each won the Military Cross for their efforts. Corporal David Abols was awarded a Distinguished Conduct Medal for his daring charges which turned the Darwin Hill battle. After the victory on Darwin Ridge, C and D Companies began to make their way to the small airfield as well as Darwin School, which was east of the airfield, while B Company made their way south of Goose Green Settlement. A Company remained on Darwin Hill. C Company took heavy losses when they became the target of intense direct fire from 35 mm anti-aircraft guns, causing 20 per cent casualties. Private Mark Hollman-Smith, a signaller in the company headquarters, was killed by anti-aircraft guns while trying to recover a heavy machine gun from wounded Private Steve Russell. Lieutenant James Barry’s No. 12 Platoon, D company, saw some fierce action at the airfield. They were ambushed, by another platoon of the 25th Regiment but one of his men shot dead two of the attackers, and then reported the events to Major Neame. [g] The platoon sergeant charged the attacking enemy with his machine gun, killing four of them. Private Graham Carter won the Military Medal by rallying No. 12 Platoon and leading it forward at bayonet point to take the airfield. The IR25 platoon defending the airfield fled into the Darwin-Goose Green track and was able to escape. Sergeant Sergio Ismael Garcia of IR25 single-handedly covered the withdrawal of his platoon during the British counterattack. He was posthumously awarded the Argentine Nation to the Valour in Combat Medal. Four Paras of D Company and approximately a dozen Argentines were killed in these engagements. Among the British dead were 29-year-old Lieutenant Barry and two NCOs, Lance-Corporal Smith and Corporal Sullivan, who were killed after Barry’s attempt to convince Sub Lieutenant Juan José Gómez Centurión to surrender, had been rebuffed. [h] C Company had not lost a single man in the Darwin School fighting, but Private Steve Dixon, from D Company, died when a splinter from a 35 mm anti-aircraft shell struck him in the chest. The Argentine 35mm anti-aircraft guns under the command of Second Lieutenant Claudio Oscar Braghini reduced the schoolhouse to rubble after sergeants Mario Abel Tarditti and Roberto Amado Fernandez reported to him that sniper fire was coming from there. J Company, 42 Commando, RM arrive in Goose Green as reinforcements on the evening of 28 May after fighting had ceased, but prior to the Argentinian surrender. By last light, the situation for 2 Para was critical. A Company was still on Darwin Hill north of the gorse hedge, B Company had penetrated much further south and had swung in a wide arc from the western shore of the isthmus eastwards towards Goose Green. They were isolated and under fire from an Argentinian platoon and unable to receive mutual support from the other companies. To worsen their predicament Argentine helicopters—a Puma, a Chinook and six Hueys—landed southwest of their position just after last light, bringing in the remaining Company B of IR12 (Combat Team Solari) from Mount Kent. B company managed to bring in artillery fire on these new reinforcements, forcing them to disperse towards the Goose Green settlement, while some re-embarked and left with the departing helicopters. For C Company, the attack had also fizzled out after the skirmish at the school-house with the company commander injured, no radio contact and the platoons scattered with up to 1,200m between them. The C Company second-in-command was also unaccounted for. D Company had regrouped just before last light, and they were deployed to the west of the dairy; exhausted, hungry, low on ammunition and without water. Food was redistributed to share one ration-pack between two men for A and C Companies, but B and D Companies could not be reached. At this time a British helicopter casualty evacuation flight took place, successfully extracting C Company casualties on the forward slope of Darwin Hill under fire from Argentine positions. To Keeble, the situation looked precarious: the settlements had been surrounded but not captured, and his companies were exhausted, cold and low on water, ammunition and food. His concern was that the Company B reinforcements dropped by helicopter would either be used in an early morning counter-attack, or used to stiffen the defences around Goose Green. He had seen the C Company assault stopped in its tracks by the AA fire from the airfield, and had seen the Harrier strikes of earlier that afternoon missing their intended targets. In an order group with the A and C Company commanders, he indicated his preference for calling for an Argentine surrender rather than facing an ongoing battle the following morning. His alternative plan, if the Argentines did not surrender, was to “flatten Goose Green” with all available fire-power and then launch an assault with all forces possible, including reinforcements he had requested from Thompson. On Thompson’s orders, J Company of 42 Commando, Royal Marines, the remaining guns of 8 Battery, and additional mortars were helicoptered in to provide the necessary support. Once Thompson and 3 Brigade had agreed to the approach, a message was relayed by CB radio from San Carlos to Mr. Eric Goss, the farm manager in Goose Green – who in turn delivered it to Piaggi. The call explained the details of a planned delegation who would go forward from the British lines to the Argentine positions in Goose Green bearing a message. Piaggi agreed to receive the delegation. Soon after midnight, two Argentine Air Force warrant officer prisoners of war were sent to meet with Piaggi and to hand over the proposed terms of surrender. [j] On receiving the terms, Piaggi concluded “..The battle had turned into a sniping contest. They could sit well out of range of our soldiers’ fire and, if they wanted to, raze the settlement. I knew that there was no longer any chance of reinforcements from 6th [Compañía ‘Piribebuy’] Regiment’s B Company and so I suggested to Wing Commander [Vice Commodore] Wilson Pedrozo that he talk to the British. He agreed reluctantly.” The next morning, agreement for an unconditional surrender was reached and Pedrozo held a short parade and those on parade then laid down their weapons. After burning the regimental flag, Piaggi led the troops and officers, carrying their personal belongings, into captivity. Lieutenant-Colonel Herbert ‘H’ Jones was buried at Ajax Bay on 30 May; after the war his body was exhumed and transferred to the British cemetery in San Carlos. He was posthumously awarded the Victoria Cross. Major Chris Keeble, who took over command of 2 Para when Jones was killed, was awarded the DSO for his actions at Goose Green. Keeble’s leadership at Goose Green was one of the key factors which lead to the British victory, in that his flexible style of command and the autonomy he afforded to his company commanders was much more successful than the rigid control and adherence to plan exercised by Jones. Despite sentiment among the soldiers of 2 Para for him to remain in command, he was superseded by Lieutenant-Colonel David Robert Chaundler, who was flown in from Britain to take command of the battalion. Argentinian cemetery north of Darwin where most of the Argentinian casualties of the Goose Green battle were buried. Memorial to Lt. Col. H. Jones VC OBE, outside Darwin settlement, marking the spot where he was killed. Memorial to casualties from 59 Independent Commando Squadron, Royal Engineers, one of whom was killed in the Battle of Goose Green – NW of Darwin settlement. Unofficial memorial to a fallen paratrooper in the gorse leading up to Darwin Hill. During the planning of the assault of both Darwin and Goose Green, the Battalion Headquarters were listening in to the BBC World Service. The newsreader announced that the 2nd Battalion of the Parachute Regiment were poised and ready to assault Darwin and Goose Green, causing great confusion with the commanding officers of the battalion. Lieutenant Colonel Jones became furious with the level of incompetence and told BBC representative Robert Fox he was going to sue the BBC, Whitehall and the War Cabinet. For over two years we’ve been waiting for a final say on behalf of the courts … There are some types of crimes that no state should allow to go unpunished, no matter how much time has passed, such as the crimes of the dictatorship. Last year Germany sentenced a 98-year-old corporal for his role in the concentration camps in one of the Eastern European countries occupied by Nazi Germany. It didn’t take into account his age or rank.